Thanks this is a great post. If anything it is too short! I'm not interested so much in arcane discussions about the history of balrogs, but questions of ethics and the deeper significance of things in TLOTR is endlessly fascinating. I agree with you about Gollum and excessive mercy. It always bothered me, in fact. There is a fine line between heroic virtue and mere foolishness. The minor detail Tolkien tosses out about Gollum being a baby-eater really sealed my opinion. If he was a mere skulking thief then I can understand Gandalf's patience, but seriously, baby eater! I wonder if Tolkien just got carried away with that line and kind of forgot about it later in the book when Gollum became a main character. Tolkien is a hopeless melancholic and retrophiliac, so much so that by the end of his life he was quite the cranky old luddite. I understand him well, having the same temperament, but it bothers me that he actually consciously believed that the history of the world, including salvation history, was "the long defeat". As far as I can tell his eschatology was the same that you have lamented here before – the Church is destined for defeat with a sudden, last minute, deus ex machina victory just before the destruction of the world. Its hard to be a student of history, especially pagan history like Tolkien was, and feel much optimism and confidence about the future of humanity. But this is just another example of Christianity's need to renew our popular understanding of eschatology. Sometimes Tolkien's attitude towards hope seems to be a kind of Custer's-last-stand hopeless heroism. Fortunately I think he got it pretty good in the LOTR. His other works, even including the Appendix, are much more tragic. When I was kid I hated the parts with Sam and Frodo in Morder and its environs. It was so dry and dreary compared to all the heroic and exciting adventures the other members of the fellowship were having. But reading it recently I was surprised to realize how beautiful and profound those passages were. I guess you really need to suffer first before you can appreciate them. St. Padre Pio, the great 20th mystic also ate very very little food for many years, and it did not seem to effect his energy. I remember an anecdote about him musing about why he needed so little food. He speculated that his body was like a very fertile field. Brother Andre, also a 20th century (Canadian!) miracle man ate little more than a bit of flour and water each day besides the Eucharist, and died in 1937 at 91! Like lembas, the Eucharist was more efficacious, more life-giving, because it was combined with fasting. Many books have been written unpacking this remarkable novel. It is like the Bible - a seemingly endless vein of riches to be mined. Joseph, I agree - it would have been easy to make Gollum's guilt a bit less clear-cut, thus making it seem rather less a raging injustice to let him live :). I think my eschatology is probably more hopeful than Tolkien's was. 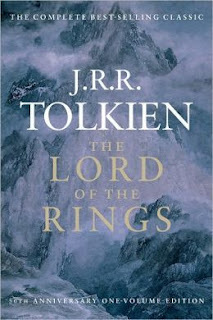 However, I was pleasantly surprised by how forward-looking and hopeful LOTR in many ways is. In Denethor and Theoden we have two terrific morality tales about the folly of despair, and for all its bittersweetness it still ends with an unambiguous victory. I can definitely appreciate it from a postmil viewpoint :). Jamie, you're right. The ending is the best part (though probably still not my absolute favourite!). strange, it doesn't appear as though my comment posted. please delete if this winds up being a double post later. i suspect that you are discounting Gandalf's status as Maiar. Gandalf is not truly mortal, never was, and is much more closely connected to the Valar and Ilúvatar himself than even the Elves are. in Christian terms, all of the Istari are angels sent to Earth to aid and protect ( and perhaps wrestle with ) those faithful mortals who serve God. as such, Gandalf has a much clearer idea of what Ilúvatar plans and has foreseen than any mortal or other Middle-Earth bound immortal who is not Istari as he is. i think that the Elves spared Gollum because the Istari prevailed upon them not to punish Gollum for his crimes, as the Elves *do* punish all others who offend them in their territories. after all, Gollum was the ( unknown ) custodian of the Ring for all those years. either he was protected by the Ring or the Will of Iluvatar. i prefer to infer that, as with Gandalf seeking out Bilbo, this was an expression of something Iluvatar wanted to happen. the opportunity for Gollum to repent was not insignificant, but whatever his choice the outcome for the Ring was assured. You say that it's the ending that moves you the most, and the ending is indeed incredibly bittersweet. But I consider the arrival of the Riders of Rohan at the Battle of Pelennor Fields the high water mark of fantasy literature. It is basically everything I love about the genre. Bob, h'mm, good point. Gandalf definitely has a very special status as an angelic figure. I was under the impression that the Istari acted rather more freely than I tend to think of the angels, fallen or unfallen, acting. Saruman, after all, didn't fall so much as sauntered vaguely downward, and Radagast, Allatar, and Pallando were all hinted by Tolkien to have more or less allowed their mission to lapse. But maybe my impression is false - it's been years since I got my informal degree in Tolkien Studies ;). Anyway, no contest that whatever happened to Gollum is supposed to have been foreordained by Iluvatar. But while providence may indeed keep a specific malefactor from justice, I can't help feeling that Gandalf's way of framing the question tends to fudge basic principles of justice. Malcolm, actually, my favourite chapter in the whole book (which makes it the twelve pages I love best in the world) is the Battle of the Pelennor Fields and everything around it. You said it: chills :). but i'm not so certain about the lack of autonomy of angelic beings, even today. Lucifer rebelled, after all. and while there was a great sorting of the angels ( those being prone to rebellion leaving, those not, staying ) at the Fall, i'm not certain that those originally loyal to God could not also be eventually corrupted. but that's not truly relevant anyways, i was simply drawing an analogy. analogies are, by their very nature, inexact simulacra. I can't help feeling that Gandalf's way of framing the question tends to fudge basic principles of justice. neither Frodo nor any other member of the Fellowship was a judge nor involved in trying Gollum for his crimes. given that Frodo wasn't defending his own life or the lives of others ( when this statement was made ), neither could he make any claim to Lawful Self Defense. Gandalf agrees that Gollum deserves death. what he's warning Frodo against is simply walking down the street knocking someone in the head because you think they look hinky or you've heard stories ( Pizzagate ) about them. what mercy is extended to the next child he cannibalises? you assume too much, the text doesn't assert this, at least not in the discourse between Gandalf and Frodo. "The wood was full of the rumour of him, dreadful tales even among beasts and birds. The Woodmen said that there was some new terror abroad, a ghost that drank blood. It climbed trees to find nests; it crept into holes to find the young; it slipped through windows to find cradles." you have rumors of vampirism ( not cannibalism ), and Gollum, not being a true vampire, will not be converting anyone else by the drinking of blood. nests and holes involve victims which aren't even human ( "beasts and birds" ). that's akin to telling me i'm a murderer because i had bacon and eggs for breakfast. what you don't have is testimony that any particular child was murdered ... or even harmed. you don't even have a single name. would i put the murder or cannibalism of a child past Gollum? no, certainly not. but we have no PROOF of such things, nor has he been tried for these purported crimes. thus, you cannot simply kill Gollum and call it "justice". you can't even use the murder of Deagol to impeach him: this portion of the story was inferred from Gandalf's interpretation of THE LIES WHICH GOLLUM WAS WILLING TO SAY, according to Gandalf's own testimony, which itself is hearsay. for story purposes, do i think that Gandalf got anything significantly "wrong"? no. but deduction and inference are NOT "proof". Bob, I'm sure we don't actually disagree that much here. :) As I said in my original post, Frodo had an obligation to look after Gollum's life when he actually met him, given that he had no authority to try him and was not in any immediate threat from him. You've done a great job of explaining how Gandalf's words might be construed in terms of a warning not to kill shady characters on little evidence, but I have to admit, I still have a problem with how Gandalf's words seem to confuse categories of justice and mercy. The baby-killing passage is more ambiguous than I remembered. It sounds like these were not verified accounts. Bob, I'm sure we don't actually disagree that much here. we don't? hrrrm. that's quite depressing. i usually do a much better job of offending all and sundry. i promise to try and do better next time. Tolkien is making a point about capital punishment, a subject upon which it would appear that he and CSL had a basic disagreement. 'Vengeance is Mine' is the backdrop to JRRT's notion of justice. God gives life, and can take it away. Mortals can 'punish', in order to protect people, prevent vice or extol a virtue, but are explicitly forbidden from revenge. This is a twofold imperative. It prevents human arrogance, the appropriation of the final judgment of divinity, and permits development, restitution and penance after even the most heinous crimes. It affirms the basic ability of humans to choose to change, even from the most degraded circumstance. To deny this right is to deny humanity, and to usurp the authority of Divinity. CSL disagreed with this stance, saying for example that a murderer should give himself up to the gallows cheerfully, and that the gallows was the right outcome. In this case, I believe that CSL was mistaken. Tolkien emphatically slates the retributive vengeance approach. He implies a dreadful price of inhumanity to be paid by those who deal out death as vengeance. I know it is difficult for those living in retributive jurisdictions to understand this point of view, because dealing out death to those found guilty of terrible crimes is ingrained and indoctrinated from birth. However, blessed are the merciful; justice without mercy is mere anger, a deadly spiritual vice. Similarly, I suppose, mercy implies justice preceding it. But mercy is the greater virtue.